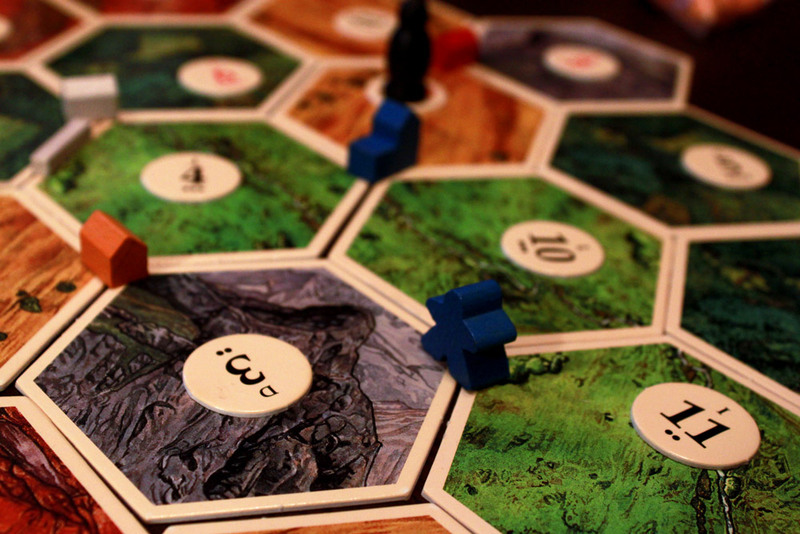 Point: Is Settlers of Catan a Worker Placement Game? I posited this thought on Twitter the other day with this tweet: “The thought occurred to me the other day. Settlers of Catan is a worker placement game.” This garnered a series of responses from multiple people, resulting in an engaging discussion that got me thinking. How do you define “worker placement” accurately, is Catan really a worker placement game or is it not, and why does it matter? Well, let’s tackle this subject. In an interesting twist, my good man GeekInsight over at Giant Fire Breathing Robot is taking on this topic as well. Read my thoughts, and hit the link at the end of the article to see what he has to say about it. To quickly generalize what a Worker Placement game is, there are a few common themes we can start with. In general, WP games have a central tableau with different placements. Each placement provides some sort of resource or action when a player’s “worker” token is placed there. (Hence, Worker Placement.) Also in general, players have multiple “workers” to place throughout the course of the game in order to advance their goals and score points. So, here is my supposition: if you think of Settlements as “workers” (and Cities as improved workers), the grid of tiles as the central tableau, and the corner intersections of tiles as the placements, what you have is a Worker Placement game. There are a few twists to expectations – for example, you don’t immediately get the resources when you place a worker, you have to wait for a placement to be “activated” by the dice rolls. And you don’t get your worker back the whole game, once it’s out it stays out. But these are minor creative twists to the establishment. The first question I want to tackle is, why does this matter? 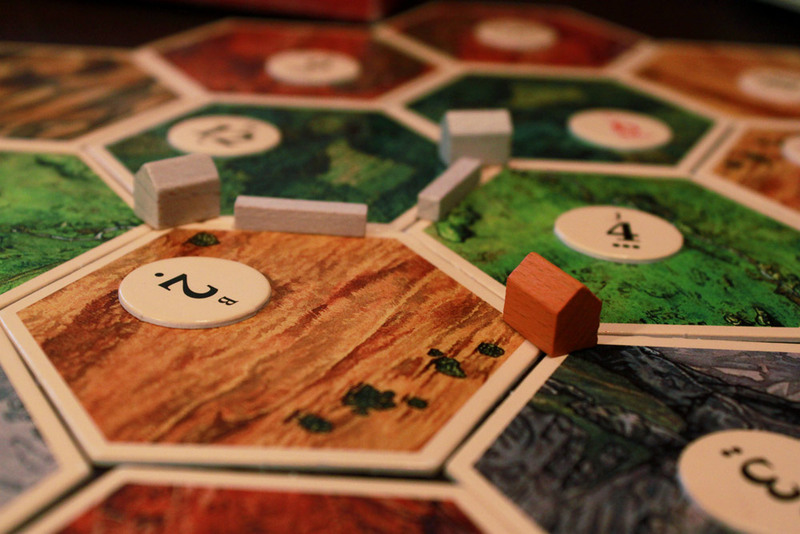 Who cares if Catan is a Worker Placement or a Resource Management or a Network Building game or what have you? Well, as someone who constantly teaches new games to players of all different levels of skill and experience, I do. I care. When a game has a defined mechanical genre, it reasonably gives potential players an expectation of what the game will be like. I know that Ascending Empires, a lite 4x game (explore, expand, exploit, exterminate) is going to be a vastly different experience from Race for the Galaxy, a tableau-building card game, despite the fact that both games feature space and the expansion of a galactic empire. It gives me some context when looking at games I want to try or to buy and helps me make wise purchasing decisions. Even more importantly, though, it gives a sense of familiarity when encountering games with similar mechanisms. When I first started teaching games to my non-gaming family, I had very little to go on. So I started with the basics. Kill Dr. Lucky is kind of like Clue – you move around a mansion, there is a non-player character central to the purpose of the game, and rooms have a simple but necessary purpose. Sure, the mechanisms in this case are pretty wildly different, but the theme and the locale of the game brought in some familiarity. Instead of looking at the game board and seeing an overwhelming number of graphics and icons, the players see…. a mansion, with rooms. I’ve compared Carcassonne to Dominoes, Ticket to Ride to Rummi-kub, and many more I can’t even think of right now. Familiarity allowed me to bring these people into the game world. The nice thing is, the more games people learn, the easier it is to teach them new games. Though I started with Clue as my launching point, I now have dozens of games to draw comparisons from when explaining a new game. Whereas before the term “Deckbuilding game” would have brought me blank stares, it’s now a helpful reference. 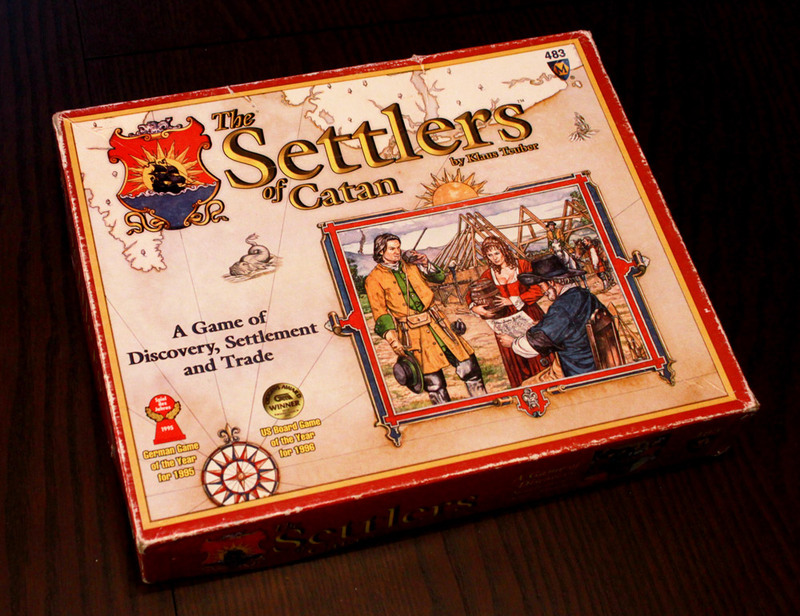 Settlers of Catan is one of the more popular “gateway” games out there. It’s been around for a very long time now, enough to seep its way into the culture of America. Most people have heard of it, even if they’ve never played it. And a LOT of people have played it. But a lot of those people have stopped there. 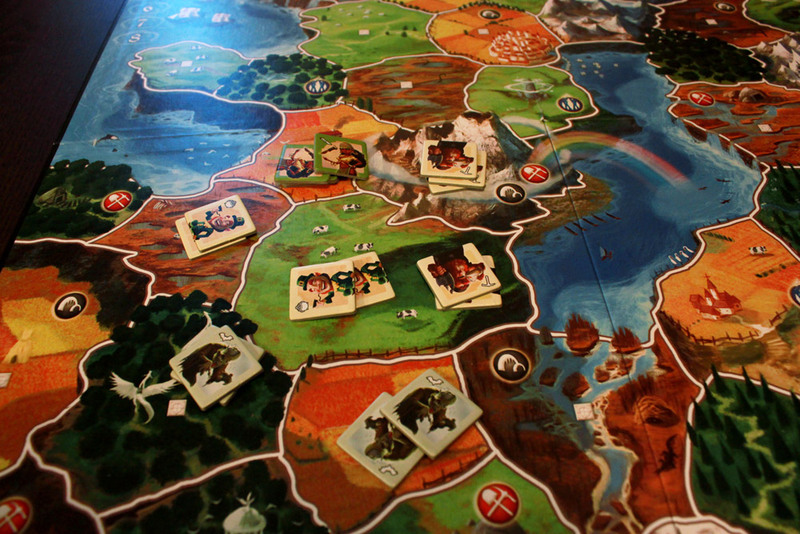 Catan is miles beyond anything they’d known before in terms of quality, though it cleverly used some very familiar mechanisms – rolling of dice, building “houses” which can later be upgraded, a sense of geography on the board – to ease the transition. But they stop there – perhaps assuming that Catan is the only game to break the mass-market mold, or that other hobby games are simply too complicated. As we all know, this is not true; games can be found in all manner of complexity and variety. However, many mechanical genres are much more unfamiliar than Catan may have seemed. Worker Placement games commonly have no dice whatsoever; no sense of location or direction; and certainly a large number of overwhelming graphics and icons to take in. Even a straightforward WP game could be too overwhelming to a new player. But what if you could use Catan to bridge the gap? That’s the point of a gateway game – to introduce new people to new boardgame concepts in a simple but fun way, so as to remain accessible but open the doors to more complex and fun hobby games. 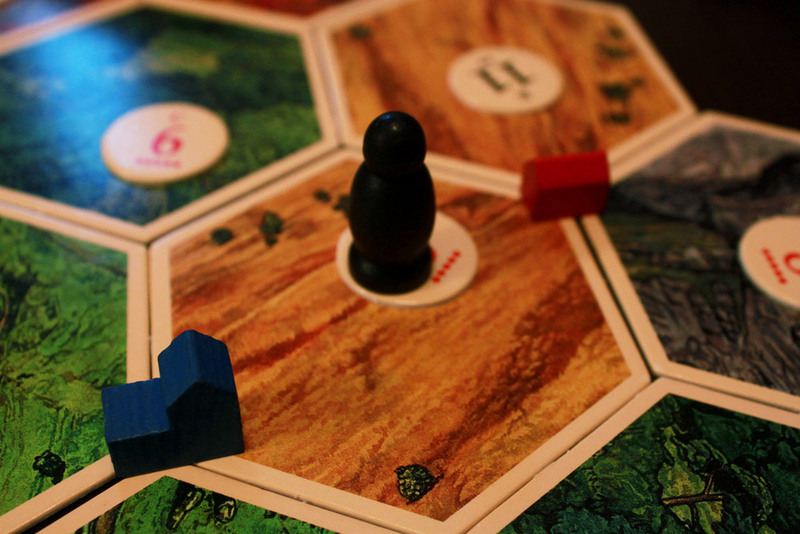 While Catan certainly doesn’t define the Worker Placement genre, if concepts of WP can be attributed to Catan, new players might be encouraged to explore more games and expand on what they know and have experienced. This applies to more than Catan – you can apply unexpected genres of mechanisms to many games to help breed familiarity and expand the minds of new and potential gamers. So, what exactly is a Worker Placement game? The most interesting thing about my twitter conversation the other day was how difficult it was to truly define Worker Placement. Many ideas were tossed around to argue against why Catan was NOT a WP game; it didn’t follow such-and-such rule, it didn’t fit into such-and-such box. And yet many of these so-called “rules” are not really defining elements of the WP genre. For every few games that followed the rule, there was another that ignored it. If you get too specific, you end up excluding creative takes on any genre, which makes the definition meaningless. However, if you pull back and define it too generally, it encompasses everything and once again becomes meaningless. So you have to separate the rules that make a game a WP game from the overly-specific conditions that only define certain games, not the genre itself. This can be more difficult than it would seem. So here’s how I would like to try and define the Worker Placement genre. These placements directly result in specific benefits tied to the game, such as gaining resources or allowing certain actions to be performed that are unique from other placements? I think something important to remember is that there are few “pure” genre games out there. Most games use elements of various mechanisms, putting them together in unique ways to create a different experience. that means that if a game (like Catan) has other elements that don’t necessarily fit into common staples of the genre, that doesn’t mean that it doesn’t partially use that genre. So, under my definition, is Catan a worker placement game? Does each player have a limited set of workers (but more than 1) represented by pawns or tokens? Yes, it has settlements/cities, a limited number of each, but more than 1. Do these placements result in specific benefits? Yes, resources are gained that are directly tied to these placements. Each placement provides different resources and at different times, making them unique to other placements. To further test this definition, let us compare it to another game that we know is not worker-placement. 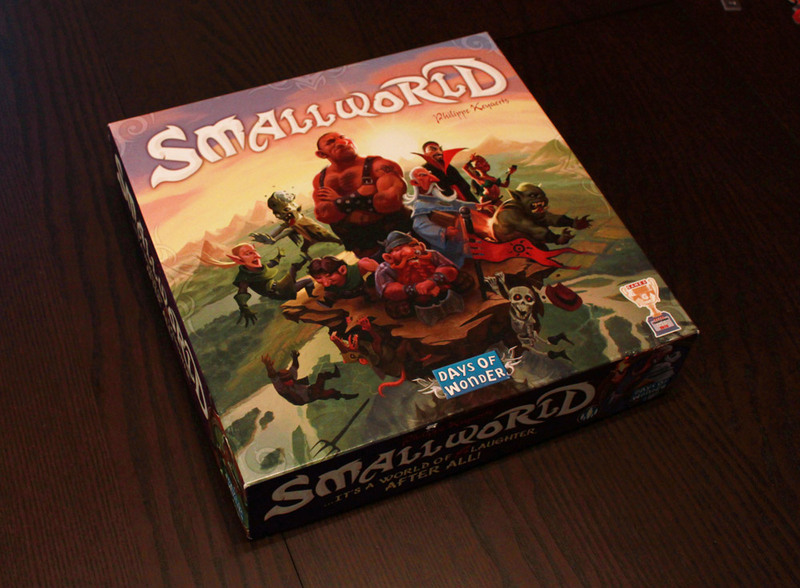 How about the classic game of Small World. Does Small World become a worker placement game when these rules are the defining qualities? Do these placements result in specific benefits? In a sense, yes. However, the focus is more on controlling more areas, so the specific placements aren’t necessarily unique from each other. Phew! We’ve shown that a game that might be considered close to a WP game – a game that clearly involves placing tokens on a board – does not fit into WP following my 3 rules. Sorry Leprechauns. No matter how much gold you offer, you’re still an area control game. Whatever elements Catan may contain – resource collection, network building, negotiation – it’s certain that Catan has elements of worker placement within its legendary city walls. Now you can head on over to GeekInsight’s take on the same subject over at Giant Fire Breathing Robot. And leave a comment below to add your thoughts, or let us know who you think is right! 4) Can the workers be removed and replaced? Stone Age, the quintessential WP game, has you placing workers anew each turn. Carcassonne has you pulling them every now and again, but they can still get recycled (except for farmers). In Catan they’re static. It’s an interesting argument that toes the line between semantics and mechanics. I could see how Catan could be called a worker placement game, with the workers placed once, but for me the fluid nature of workers changing roles and locations is what makes a game a worker placement game. > In Catan they’re static. That’s not actually accurate. In Catan, when you upgrade to a city, the settlement goes back in your supply (as per 3c on page 5 of Mayfair 4th edition rules) I’m not fully buying the worker placement argument, but technically, Catan does fit your additional rule. I had the same thought as anygamegood running through my head as I read the article. Maybe for teaching games you could liken settlers to a worker placement game, but I think if your players already understand terms like “worker placement game”, you no longer need to categorize settlers as such. With this definition, I could *almost* call Ticket to Ride a worker placement game. How about chess? Certainly even a game like Shadows Over Camelot. I’ve brought euro style games to my extended family, and I’ll tell ya… if I start throwing out terms like “worker placement mechanic”, their eyes start to glaze over. They just want to know how to play. Definitely a fun conversation though! Ticket to Ride falters on these 3 rules because placing trains gives you no immediate or direct benefits. You need to make long connections to complete your cards. Shadows over Camelot fails because each player has only 1 “Worker” to be placed; be assured, if you had more than 1 guy per player, it would certainly be WP and it’s a great example of close-but-no-cigar. Hopefully you’ll take a look at my follow-up article which posits the 4th rule needed to clearly separate WP games from everything else. Placing trains gives points and region control, regardless of your route cards. I guess we’d have to define “immediate benefit”. It also fits your new rule #4. However, the fact that I used the term “region control” may be a downside to that argument. I get ya on Shadows. However, due to the co-op nature of the game, I’d pose that it is closer to WP than you suggest. As co-op, with everyone giving input on where you move your knight, it’s almost as if each player does in fact have more than one worker to place… though the connection is hazy. I’m at work, so doing lots of skimming rather than deep reading, but enjoying the argument. I feel like a piece that might be missing is the idea of workers changing jobs. Part of the strategy of WP games, in my opinion is being able to re-focus your work force to adjust to game flow. Mike, the changing jobs thing was my criterion too. Without it something may still be a kind of WP game, but not an interesting one, and not one in the sense that we typically use the term. I think this is more defining than geographical location. I just feel like it’s entirely possible to come up with a creative and enjoyable WP game that doesn’t involve changing jobs. And the differences between mechanisms are not huge regardless of what genre they fall in, so if you extrapolate too far of course you can include any game you want. Sure if you take any WP game and change it only so that workers don’t get removed, you’d have something boring. But with some creative rules you could get there and it could still be more like WP than anything else. So, yes, in TTR you get points. But every “placement” gives you points. And the region control is key, especially as it doesn’t matter which specific connections you have as long as you get from one place to another. If you don’t stretch my definitions, it doesn’t fit. And with Shadows, the fact that each player has only 1 point, regardless of how cooperative it is, is extremely important. On your turn you can’t move another player’s guy; you don’t place more than one; and in fact you don’t get a ‘benefit’ from moving your guy to any position. You have to take entirely separate actions and in most cases you actually give up something and don’t get anything directly in return. Moving farther and farther away from WP. 1. Does each player have a limited set of workers (but more than 1) represented by pawns or tokens? – As an individual, no. But as it’s co-op, I see this as a hive-mind scenario. As a group with a united goal, yes. I can’t place another player’s knight, but I do have direct input on where it goes, depending how vocal I want to be. 2. During the course of the game, are these workers placed, individually, on different locations on the board? Yes. Knights are placed on specific quest locations. 3. Do these placements result in specific benefits? Yes, being on a quest location opens up actions that are only available at that location. And with the Merlin expansion also adds the ability to place at a location that grants free cards. Also, being on the right quest when it succeeds nets health and cards. It’s a stretch, but a small one. And one that I think brings Shadows into closer proximity to WP than Catan. I think changing jobs is key, otherwise you’re just sticking a flag in the ground… claiming a territory. But at the end of the day, they are both a hell of a lot of fun with people you like hanging with. you’re still stretching my definitions. Players have only direct control over 1 ‘worker’ and that’s what matters, regardless of how much influence they have over what the other players do. Even as a co-op you still have 1 pawn per 1 player. And the benefits of “gaining additional actions” is not a direct benefit. The fact is you have to take 1 action to place your guy, and another action to do anything there, separately. And Shadows is closer to WP than Catan. If each player actually had direct control over more than 1 token, it would be much more of a WP game though, but they don’t, so it’s no. Besides in Shadows the ‘workers’ change jobs so that doesn’t exactly bring it farther away from WP. and yeah… they are fun. Although Shadows is more fun than Catan, at least in my humble opinion. Yeah, I’m thinking I’ve probably never played a full on legitimate worker placement game. And by nature, I like to stretch definitions, so there was no hope for me to begin with. I also like to argue things I don’t fully understand, because I tend to learn a lot that way. At the start of this conversation, I would have called Carcassonne WP. But it’s no more WP than Catan, really. And I agree… Shadows is the most played game I own.